Southern Utah’s Cameron Oluyitan hit a three-pointer early in the first half Monday to give the Thunderbirds a 9-7 lead. Montana’s Ahmaad Roriedribbled up the court and quickly answered with a trey of his own, giving the Grizzlies the lead again. 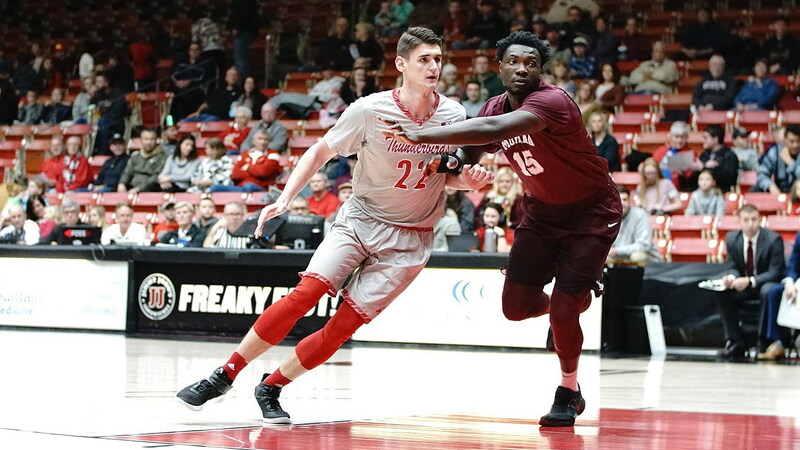 Those 24 seconds were the only time Southern Utah would hold the lead on Monday, as Montana shot 53.1 percent from the floor and cruised to a comfortable road win, 89-76. Leading 16-13 with 12 minutes to play in the opening half, Montana broke the game open with a 12-2 run in less than 3 minutes, turning a three-point advantage into double figures. During that stretch, the Grizzlies made all five of their shots while forcing three steals. Montana led by as many as 18 points and by double digits for nearly the entirety of the second half. As was the story on Saturday at Northern Arizona, senior Ahmaad Rorie led the way in the opening half –f scoring a dozen points in the game’s first 8 minutes and finishing with 23, in addition to seven assists and three steals – before Jamar Akoh took over in the second half – also finishing with 23 points on 10-of-14 shooting, plus six rebounds and three steals. Junior Kendal Manuel also had one of his best performances as a Griz, scoring 15 points on 5-of-7 shooting, while also recording five assists and five boards. Montana led for 39:27, trailing for just 24 seconds and being tied for only the game’s first nine seconds. Montana, which entered the day ranked in the top 40 nationally for shooting percentage, made more than half of its shots for the second game in a row and eighth time this season. During Montana’s 12-2 first-half run to create separation, Manuel scored the first points and recorded a steal. After SUU got within eight in the second half, its closest over the final 20 minutes, Manuel responded 4 seconds later with a three-pointer. Akoh scored 15 points in the second half, including six in the first 3:29 to extend Montana’s lead from 10 points to 16. To begin Big Sky play, Rorie is averaging 23.5 points on .576 shooting, making seven three-pointers in addition to 3.5 rebounds, 4.0 assists and 2.0 steals per game. Akoh is averaging 22.5 points on .720 shooting, also adding 7.5 rebounds, 1.5 steals, 1.5 assists and 0.5 blocked shots per game. After being out-rebounded in six consecutive Division-I games, Montana has now won the rebounding battle in three straight games since Dec. 22. The Grizzlies had 16 total assists, including seven from Rorie (ties season high) and five from Manuel (ties career high). Montana turned the ball over just 11 times on Monday. Over the past five games, the Grizzlies are averaging 10.8 turnovers per game, and have not had more turnovers than its opponents once during that span. Montana has scored at least 85 points in three consecutive games. Montana has won three consecutive road games. For the fourth time in five seasons under Travis DeCuire, the Grizzlies have begun Big Sky play 2-0. Last year, Montana won its first 13 league games. The Grizzlies have won 13 consecutive games against Southern Utah, dating back to 2002-03. Montana will play four games in the first eight days to begin Big Sky Conference play, but up next, the Grizzlies will get to play at home, hosting Sacramento State (Thursday) and Portland State (Saturday). Montana has played just one home game since Dec. 4.